Soothe skin naturally with what we think is nature's best skincare ingredients, Calendula (kal' len' dula). Commonly known as Pot Marigold, this flower has been used to safely soothe skin for centuries. California Baby's Calendula Shampoo & Bodywash uses an active percentage of this wonderful flower. 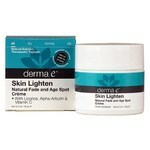 Gentle enough for everyday use and is recommended for those with sensitive, irritated or extremely dry skin. California Baby natural vegetable glucoside cleansers are sulfate free, non-stripping and extremely biodegradable, making washing a non-drying and effortless affair. California Baby's light & fresh Calming essential oil blend adds to the bathing experience. Leaves hair noticeably shiny, soft, and manageable. Taking a bath should be a soothing, relaxing, and nourishing experience. When you choose California Baby Shampoo & Body Wash, Calendula, you opt for organic formulas rich in sustainably grown ingredients. These natural products are ideal for a baby's delicate skin—as well as for any individual with sensitive, irritated, or extremely dry skin. Calendula, or pot marigold, is a soothing botanical that has been used on the skin for centuries. Today, California Baby has incorporated an active percentage of this ingredient into its Shampoo & Body Wash. Additionally, this formula includes the brand's light and fresh Calming essential oil blend, along with natural vegetable glucoside cleansers. 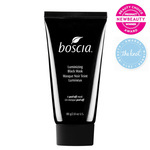 The concentrated, biodegradable product will leave the hair soft, shiny, and manageable and the skin well cleansed. This two-in-one product allows you to cleanse the body from head to toe with a mild, tear-free blend that does not include any numbing agents. 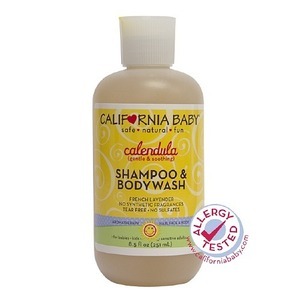 California Baby Shampoo & Body Wash, Calendula is free of sulfates, parabens, and animal ingredients. 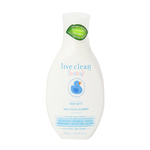 Its formula is 100% vegan, with essential oils that are pesticide free and sustainably grown. This gentle Shampoo & Body Wash does not strip or dry out your skin, instead leaving it moisturized, cleansed, and replenished with every use. Dispense a dime- to quarter- sized amount into palm, massage into wet hair starting at the scalp and working to the ends. Rinse. Repeat if needed. Follow with our hair conditioner or detangler. 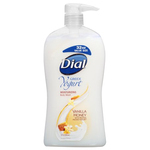 Use as bodywash in place of regular soap in bath & shower. Tip: For extra cleansing, leave shampoo in hair for 30 seconds to give it time to break-up oil, dirt and residue. Water, Decyl Glucoside (Sustainable Palm Fruit Kernel and/or Coconut), Lauryl Glucoside (Sustainable Palm Fruit Kernel and/or Coconut), Quillaja Saponaria Extract (Soap Bark), Vegetable Glycerin USP (Sustainable Palm Fruit Kernel and/or Coconut), Calendula Officinalis Flower Extract (Calendula), Viola Tricolor Extract (Pansy), Yucca Schidigera (Yucca) Extract, Aloe Barbadensis Leaf Juice (Aloe Vera), Simmondsia Chinensis (Jojoba) Oil, Hydrolyzed Quinoa Protein, Xanthan Gum USP, Panthenol (Vitamin B5), Pure Essential Oils of Lavandula Angustifolia (French Lavender), Salvia Sclarea (Clary Sage), Phytic Acid (Rice Origin), Gluconolactone (Sourced from Corn (Non-GMO), Sodium Benzoate.